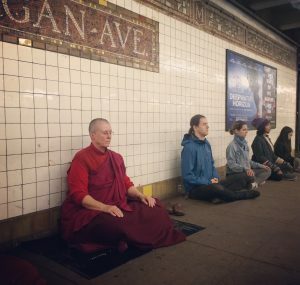 Holiness presented a profound commentary on the Anapanasati (Full Awareness of Breath) Sutra from the perspective of all three eras of Buddhist philosophy- Theravada, Mahayana/Zen and Vajrayana or Mahamudra. He included teachings from Tibetan Zen texts discovered in the Dunhuang caves. His book on these Zen writings will be published next year. Using innovative teaching techniques and incorporating sitting, standing and walking meditation, he inspired all as we trained in meditation from 4:30 am till 8pm. Even the uniforms he selected reflected his EcoSattva vision- made in Taiwan from material created from plastic bottles and coffee. 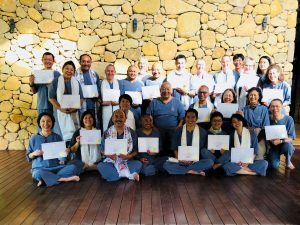 Vajra Dakini Nunnery will offer retreats on this curriculum in 2019. 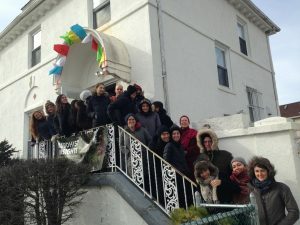 Pop Ups this winter included a talk for the Sea Mammal Rescue Center in California, the Convocation speech/workshop at the Chaplaincy Institute of Maine and several teachings in private homes including the Dharma House of Portland. 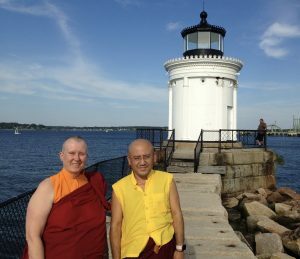 Acharya and Khenmo attended the Western Monastic Conference at Spirit Walk and spent a week at Aloka Vihara, a Theravadin Monastery. Khenmo and the Abbesses were this year’s organizers of the conference so Acharya witnessed the planning process and style of western conferences. 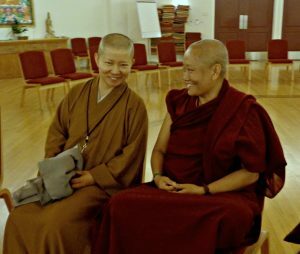 She and Khenmo also gave Dharma talks and enjoyed the wonderful community at the monastery. 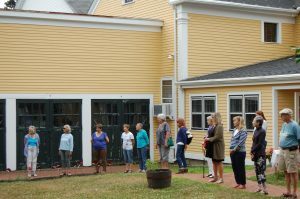 We were delighted to again host a Walk to Feed the Hungry benefiting Buddhist Global Relief and Preble Street Resource Center. See our page on these wonderful walks! Khenmo Drolma officially opened Liberation house in July! 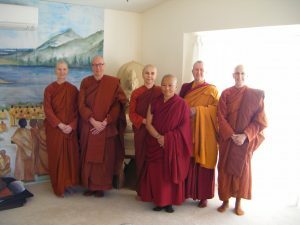 After much deliberation the Vajra Dakini Board approved purchase of a nuns residence. 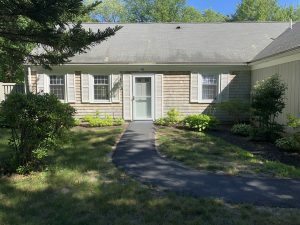 With plenty of public space available in the greater Portland area, we assessed our primary need to be a quiet residence to house our nuns and office. HE Garchen Rinpoche named it “Liberation House”. 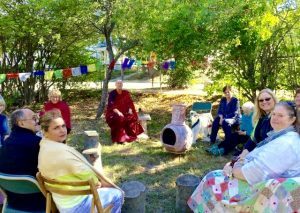 The Vajra Dakini board gathered in September for our annual Walk to Feed the Hungry and visit the new space. Nunnery in India. 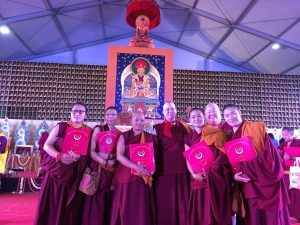 The Drikung Acharya Nuns Leadership Program is a year-long fellowship providing skills for international leadership and the future growth of Samtenling Nunnery and its graduates. 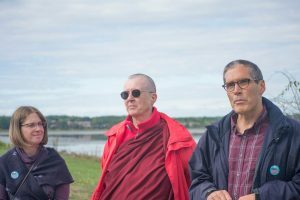 The program was developed by the Acharya nuns in conversation with an international team and is supervised by Khenmo Drolma and Mrs Taklha, former director of Samtenling Nunnery. 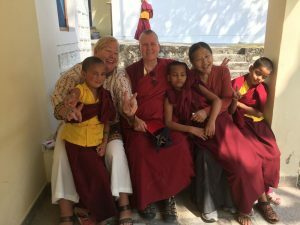 This leadership program is available to Acharya nuns (the degree granted upon completion of a ten-year philosophy program), who have basic English proficiency and a commitment to return to Samtenling to share what they have learned. 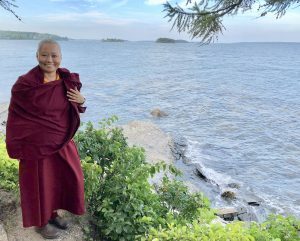 Khenmo Drolma developed an advisory committee of women leaders in the Drikung lineage from centers across the country with diverse skills and professions. Each fellow would be invited to create a personal project investigating health, education or environmental issues and experiences would be tailored to those interests. 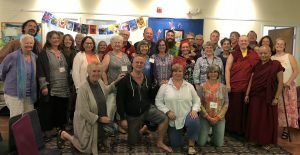 They developed a flexible program model that would offer international teaching and professional experiences, particularly in programs led by women, that could fit the interest of each visiting Acharya. The advisory team would particularly look for model projects the Achayra could visit and observe that could be duplicated or modified to benefit Samtenling Nunnery and the Drikung lineage as well as nunneries throughout India. 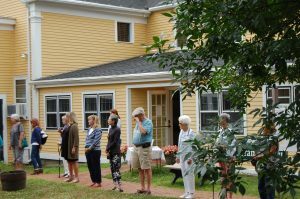 Khenmo kept up the pop up programs, speaking and leading meditation at the Kennebunk Brick Store Museum, Maine Medical Center, individual homes. 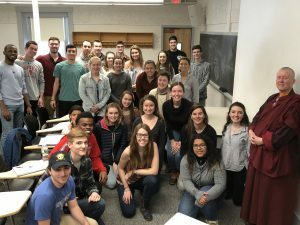 Her programs are popular at colleges and this year she spoke at University of Southern Maine, Bates College and Southern Maine Community College. 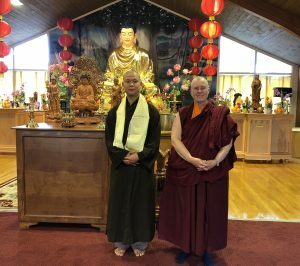 Finding new friends in Maine, Khenmo visited a newly opened Vietnamese temple in South Portland. She and Ven. Minh are exploring ways to work together. 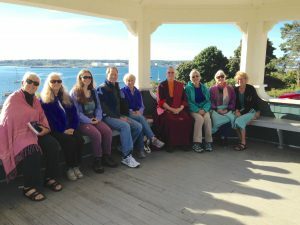 Maine Medical Center is the latest site of a Pop up meditation and with warm weather meditation in parks have begun again. 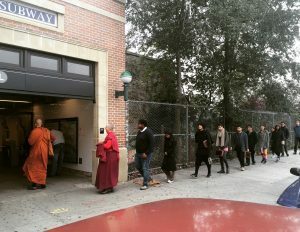 This January, thirty seven people from the world wide Drikung Sangha, gathered at the invitation of His Holiness at the Garchen Inst. 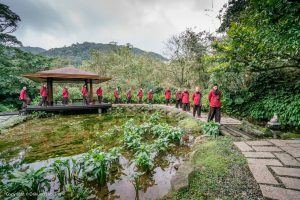 in Taiwan to learn an extraordinary new direction in teaching that HH Drikung Chetsang Rinpoche has designed for the lineage. 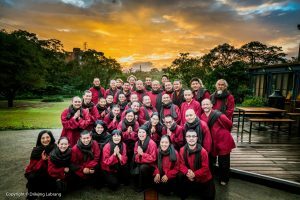 Rinpoches, monastics and lay people, in special uniforms designed by HH, practiced from 4:30 am till 9pm in silence for an exquisite week of retreat. 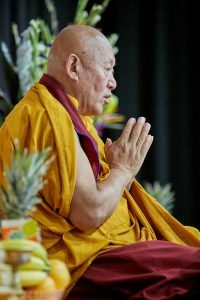 HH Chetsang Rinpoche, teaching in Tibetan, Chinese and English, united all the forms of Buddhism using the sutra believed to be the closest method of teaching meditation attributed directly to the Buddha – Anapanasati Sutra or Sutra on the Full Awareness of Breathing. 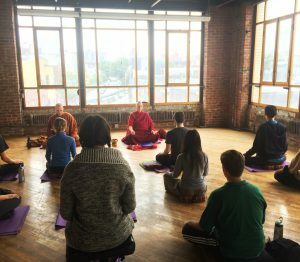 Incorporating mindfulness, zen perspective and going all the way through mahamudra in his commentary and instruction, he guided the teachers on how to use this pith instruction by the Buddha to full enlightenment. 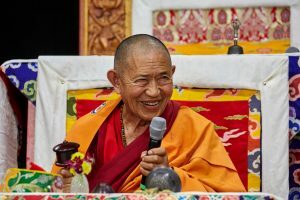 These profound teachings will be now be offered by the trainees so that the Drikung Kagyu maintains its emphasis on deep practice, now and in the future. 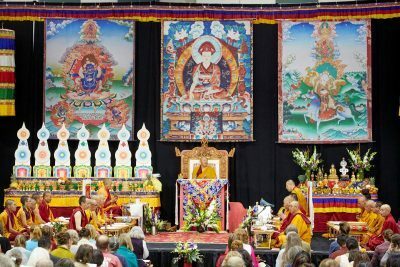 During the winter, Khenmo taught the Patience Chapter of Shantideva’s Guide to the Bodhisattva’s Way of Life at Gar Drolma in Ohio, taught at local universities, and participated in multiple interfaith activities. Most significant however, was the pilgrimage to India for the anniversary of the lineage described below. 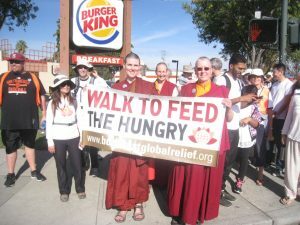 Our First Annual Walk to Feed the Hungry raised $1725 for Buddhist Global Relief! $200 was donated to Preble Street of Portland and was fun as well as informative re hunger issues. Khenmo Drolma, Tom Speis (president of BGR) and Michelle Lamm (Program Director of the Maine Hunger Initiative) gave inspiring talks. Read about Hunger in Maine. 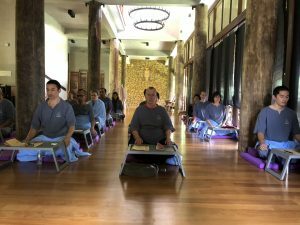 Life Release ceremonies are very popular among buddhists and moving because we see the moment a living being is released from fear, suffering and certain death. 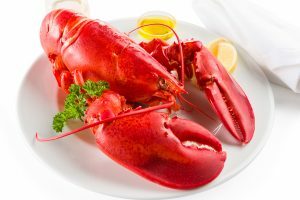 Maine is a lobster focused state with most tourists looking forward to their lobster dinner. 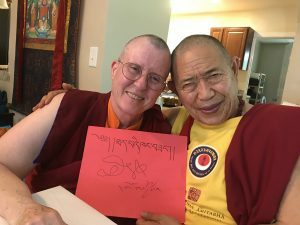 Khenmo joined with Dzigur Kongtrul Rinpoche’s sangha in a Life Release Ceremony. 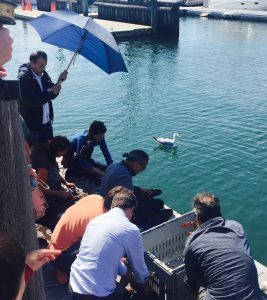 On a Portland wharf over 650 lobsters were returned, one by one, to their home in the sea along with many prayers for the release of all beings. 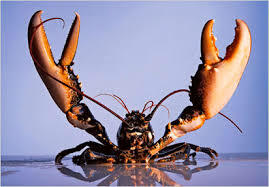 It was illuminating to witness the individuality of each lobster and their deep desire to be released form captivity. Their tails were notched so that they will not be caught and sold again. 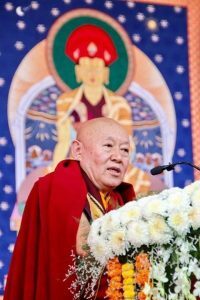 In his instructions for the 21st century, HH Drikung Chetsang asked us to look at caring for the planet as the biggest possible Life Release! 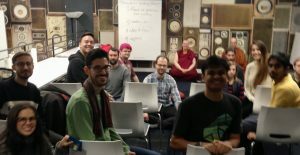 Nearly 100 people gathered to meet rinpoche and listen to his talk on bodhicitta. 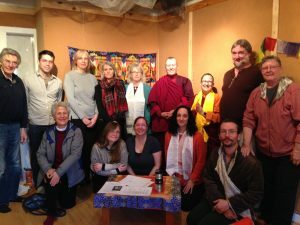 Before and after we showed him the beauty of Maine and even fit in a meeting with the Vajra Dakini Board of Stewards! 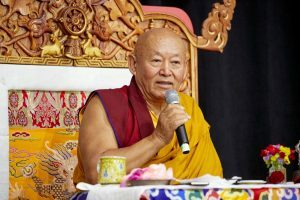 Drikung Monlam 2017 Arizona 500 practitioners gathered to celebrate the 800th anneversary of Lord Jigten Sumgon’s enlightened leadership of our lineage. 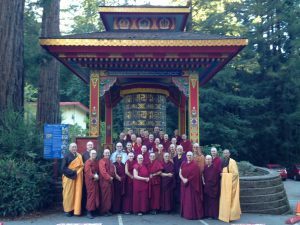 Hosted by the Garchen Institute, 40 US Centers gathered for 4 days of prayers including Vajra Dakini. 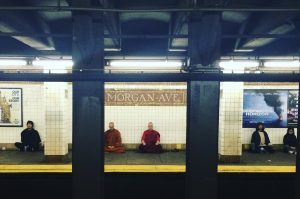 We are happy to explore diverse settings to introduce the practical applications of meditation. 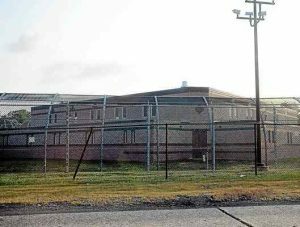 Khenmo presented the “Roots and Application of Mindfulness” for the staff of the Ann Klein Forensic Center in New Jersey. The Ann Klein Forensic Center is a 200-bed psychiatric hospital serving a unique population that requires a secured environment for individuals suffering from mental illness who are also within the legal system. Her talk included the uses of mindfulness for harmony in the workplace, working with addictions and self care for staff. Interfaith events are always a wonderful way to share the tools we treasure. 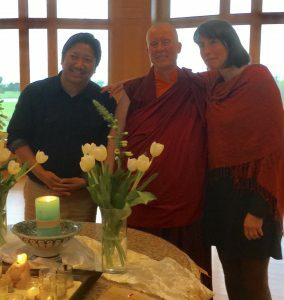 Khenmo spoke on Tonglen at the All Souls Interfaith Gathering Service in Vermont, which also included the Tibetan musician Migmar Tsering; on Compassion at “Together We Pray” in Maine and gave the benediction at the Chaplaincy Institute of Maine’s graduation. 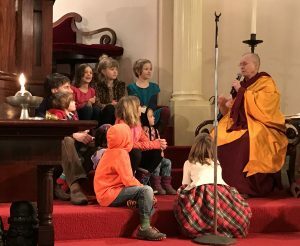 Spring began with a class by Khenmo on the Perfection of Wisdom for the BYOMA KUSUMA BUDDHADHARMA SANGHA in Bowdoinham Maine. A helpful quote from the talk: “First what is not meritorious is put to an end. In the middle, any kind of identity is put to an end Finally, all views are put to an end. Those who understand this are skilled.” Ayradeva. 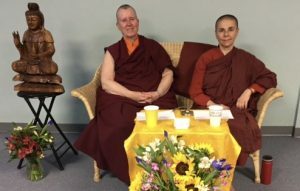 “One Teacher Many Paths” – Khenmo and Ayya Santacitta presented a dialogue and one day retreat in Portland. View the video on their commitment to monastic life. Rockaway for thirty students. 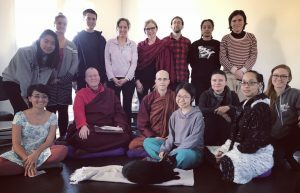 Offering compassion training, commentary on Milarepa songs and Calm Abiding meditation was a joyful way to celebrate the beginning of the Tibetan New Year! 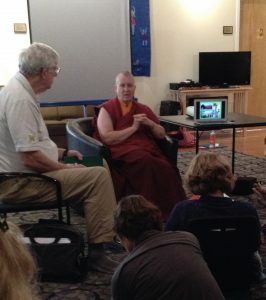 The teachings at Google centered on Tonglen or mind training in compassion. 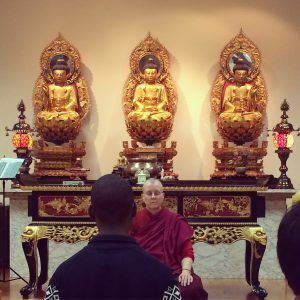 The weekend retreat was on the tolerance chapter of The Bodhisattva’s Way of Life. 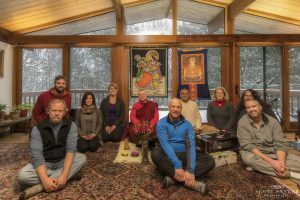 In December and January, Khenmo completed two months of retreat at the Forrest Refuge Center of Insight Meditation Society, in Barre, MA. 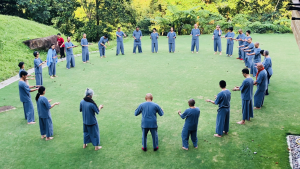 This wonderful retreat center hosts 30 people on individual silent retreats and has maintained continuous retreat for 14 years. 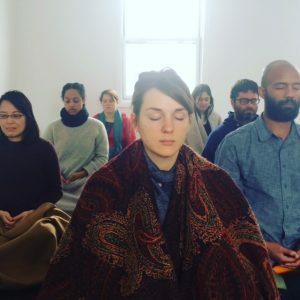 Mindfulness and calm abiding practices pervade the full day and every activity from sitting in the main shrine room to walking to meals and even while eating the meals and lying down to sleep! 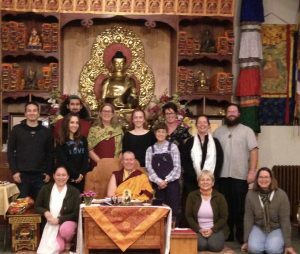 Khenmo emerged from retreat in February to a full schedule with seminars and retreats for groups colleges and in private homes! She worked with the Maine College of Art, Sadhana and the Kismet Foundation in Maine. 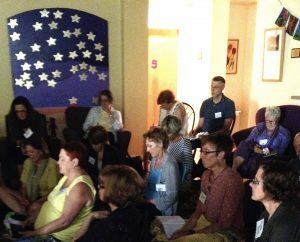 In San Jose CA, 78 people gathered to walk and $12,ooo was raised for many worthy international and local projects. 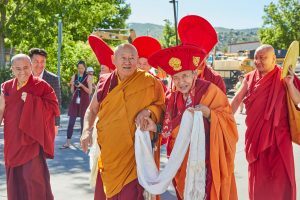 Thirty seven western monks and nuns gathered at the Land of Medicine Buddha in California to share wisdom on the topic of sustaining monastic life into 2080! We heard from many western learned monastics representing all lineages of Buddhism with their legacy from diverse Asian countries. 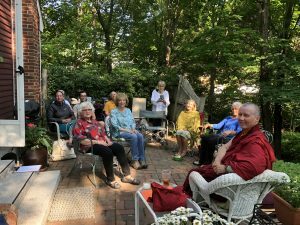 Friendships made from this gathering over the years have brought monastics from other traditions to Vajra Dakini Nunnery and a rich sharing of traditions. This year’s discussions included the emerging understanding of origin bias in texts due to early mistranslation of key words. For instance pronouns in Chinese are gender neutral but were translated to mean male only in early translations into other languages leading to key misunderstandings. 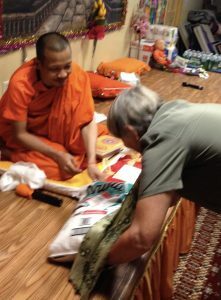 Khenmo offered a presentation on creativity in teaching the Dharma and in enriching monastic life. 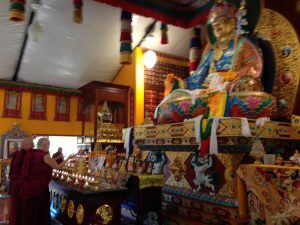 The group always enjoys learning about its host monastery and endeavors to learn about other local monasteries as well. 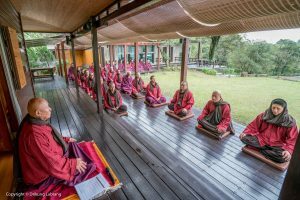 This year we were hosted by a center in the Geluk tradition and neighboring monastery Pema Osel Ling of the Nyingma graciously offered tea and we were thrilled to see the beauty of their temple..
“Strive at first to meditate upon the sameness of yourself and others. In joy and sorrow, all are equal. Thus be a guardian of all as of yourself. 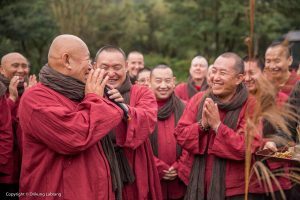 Khenmo Drolma created a program for the convocation of this year’s entering class of ChIME. She talked about the images of compassion that are touchstones for our lives of service and engendering vast aspiration to benefit beings. Her talk addressed the nature of “a calling” or turning points in life that inspired her ordination and commitment. Students then each contemplated the image of compassion most meaningful for them to hold onto as they train in ministry. 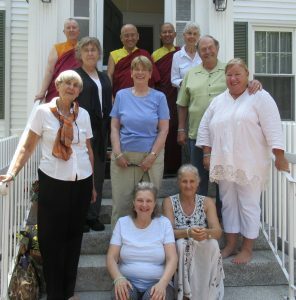 Celebrating Ga mpopa Day, Khenmo and board members, Joan and Elizabeth, visited Watt Samaki, a Cambodian monastery in rural Maine. A drive on Maine backroads took us to a solitary church on a crossroad which was the only public marker of Buxton. The folks had heard of the road we were looking for, but not the monastery. 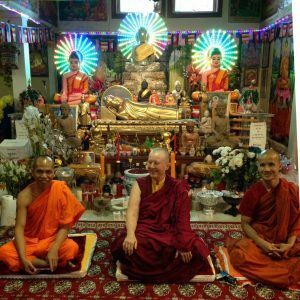 A hidden Dharma gem, the monastery with three resident monks was behind the facade of a new England home!